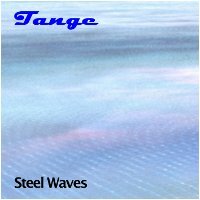 Tange returns to Earth Mantra with a delicous collection of meditative pieces called Steel Waves. Gordon Macmillan, the artist behind the Tange project, never ceases to amaze us with his patient approach to the ambient arts. He cites Tangerine Dream as one of his primary influences (hence the name), but to be honest we feel he has a very distinctive voice of his own, with very little of the formulism the Berlin School sometimes engenders. One can hear the occasional homage to Tangerine Dream in his music, but the overall impact is clearly his own, with nothing the least bit derivative about it. Recently we discovered that Gordon is a multi-instrumentalist, proficient not only on keyboards but also on the lap steel guitar, as evidenced by his recent album Ege Denizi with Phillip Wilkerson. With this latest work, Gordon brings us a sublime composition in four parts, composed of nothing but solo lap steel guitar, performed to utter perfection. The best word we can use to describe this album is "dreamy". While listening, one feels as if one is floating in the clouds, softly drifting with the breeze in a sky of purest blue. This music is absolutely perfect for playing in the background while working or reading or otherwise relaxing. It is tranquil and peaceful, a sublime backdrop to quieten the mind and soothe the soul. We listen to a lot of ambient music, but we would be very hard pressed to find a more delightfully comforting album than this one. Definitely an important part of any serious collection of ambient music. We are very happy to bring our audience another release by Gordon Macmillan, and hope that he continues down the path he has defined with this lovely work. Highly recommended. Lie down, put on your headphones, close your lids, play Tange and gently float in the space. That's what I love from this masters of Ambient Music. Very beautiful and positive music, it creates a sensation of peacefulness. Tange you rarely disappoint. Few people understand ambient music the way you do. Thanks for another beauty. I have been enjoying this release all week while going to sleep. His music always allows my mind to rest, and "Steel Waves" is another excellent release that will be in my nighttime playlist for a long time. Thanks Tange!